I drew a lot as a kid, and I mean, a LOT. But since I became a Designer, my visual muscles suffered an intense mass loss. As a technology enthusiast I ditched my notebook and pen for shiny iPads and expensive Apps like Paper. Recently, while note taking on my iPad or iPhone, I felt alienated. I was frustrated by the highly detailed, text-only notes that left no space to emotions or personal thoughts. Meetings and conferences became a source of stress, since I had to capture every single detail. I was obsessed with details. Last week I gave up. I took some time to think. Relaxed a bit and decided to go back to the basics. Note taking made me focus on capturing big ideas. To write and draw made the activity fun and enjoyable. Concepts, ideas, thoughts, emotions were captured with drawings and type blended together by creativity. Since your mind and body are acting together, you are able to recall more of what you hear and draw. Kids draw constantly to express ideas, and guess what? You were a kid too once. Drawing an idea can often take just a fraction of time needed to describe the same idea in verbal detail. To help me get back in to practice and to soothe the stress of going back to analogue I bought myself the Evernote Smart Notebook by Moleskine. 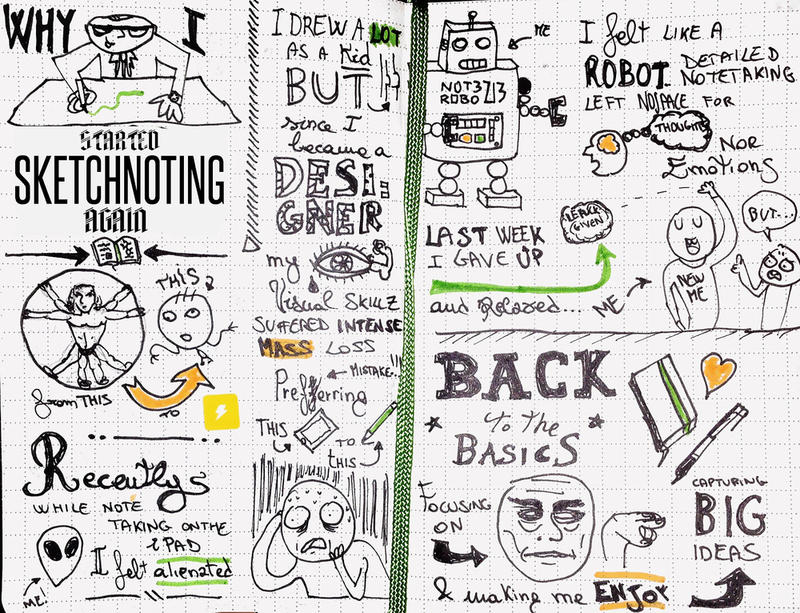 I started using again Evernote only recently. Before today I couldn't seem to find a place for the service in my workflow. I now use Evernote to store literally everything. Business cards, phone numbers, restaurant menus, sketches, references, etc... It has become the ultimate digital Archive folder in my daily workflow. The Evernote Smart Notebook by Moleskine perfectly fits it's purpose. It turns your written ideas and sketches into digital notes. The Evernote Page Camera works with the specially designed pages of this book, and with the included Smart Stickers, to make everything searchable and shareable. Though pricey for a Moleskine, the notebook comes with a free 3 months subscription to Evernote Premium (value: 15€) allowing you to boost your monthly uploads to 1GB each month, offline notebooks (wonderful for the ones that like me travel a lot) and an enhanced PDF & document search.